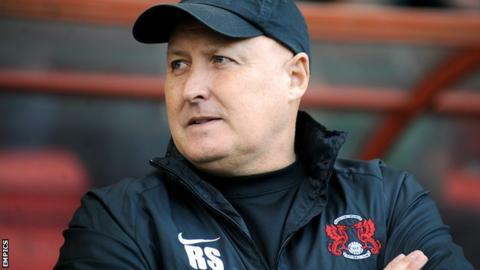 Leyton Orient manager Russell Slade has been told by owner Francesco Becchetti that his job is under threat following their poor start to the season. The O's lie one point above the League One relegation zone ahead of the trip to Notts County on Tuesday. "The president has been honest enough to tell me we have one game to sort it out," Slade told BBC London 94.9. "Hopefully we get a response on Tuesday. The situation is we need to get a win or that will be curtains." Slade led Orient to the play-off final last season but saw his side miss out on promotion after they were beaten by Rotherham United on penalties. Italian businessman Becchetti bought Orient this summer to replace Barry Hearn, who had been at the club for almost 20 years, as owner. After Saturday's 2-0 defeat at home to Colchester, which left the O's with just one win from their opening six league games of the season, Slade was informed by sporting director Mauro Milanese that Becchetti expected an immediate upturn in results. Slade is the fourth longest-serving manager in the top four divisions of English football, having been appointed in April 2010, and accepts that he is under pressure. "That's life and it can be football. Unfortunately it can be a cruel world," the 53-year-old former Yeovil and Brighton manager said. "It is not a great result for the football club. These things can happen. "Obviously the president will want better than that and, of course, we all want better than that. "We have a lot of work to do before Tuesday. That has to be the focus. "I love this football club and the fans have been magnificent. "We just need to get back on track, hope everybody pulls together and that we can get a positive result on Tuesday."